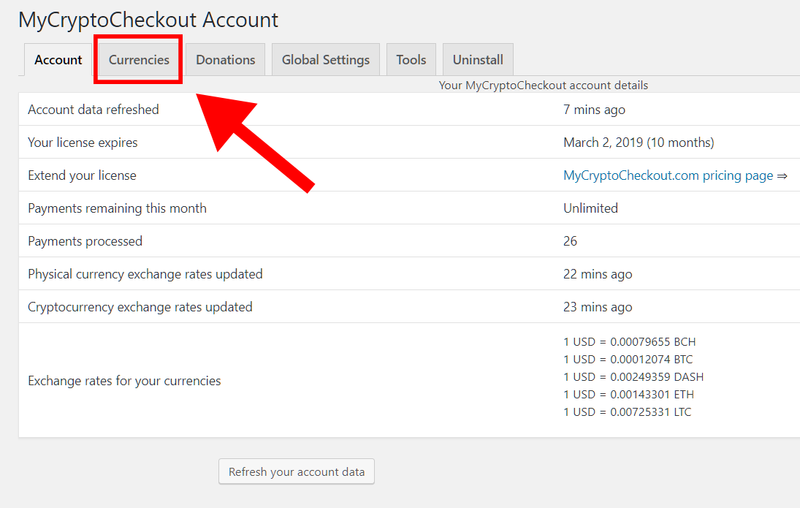 Adjust the cryptocurrency settings by visiting wp-admin > Settings > MyCryptoCheckout > Currencies. You can choose to accept cryptocurrency payments in as many or as few currencies as you wish. You may have one or more wallets (addresses) per currency. 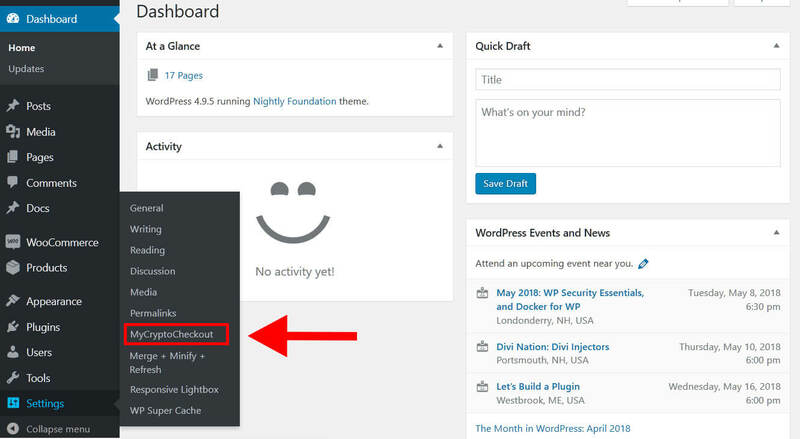 If you are on a WordPress multisite network, you can assign wallets to specific blogs. 1) In the WordPress admin go to settings > MyCryptoCheckout. 2) Click into the currencies tab. 3) Add a currency by selecting the currency, entering in the wallet address, and then save the settings. 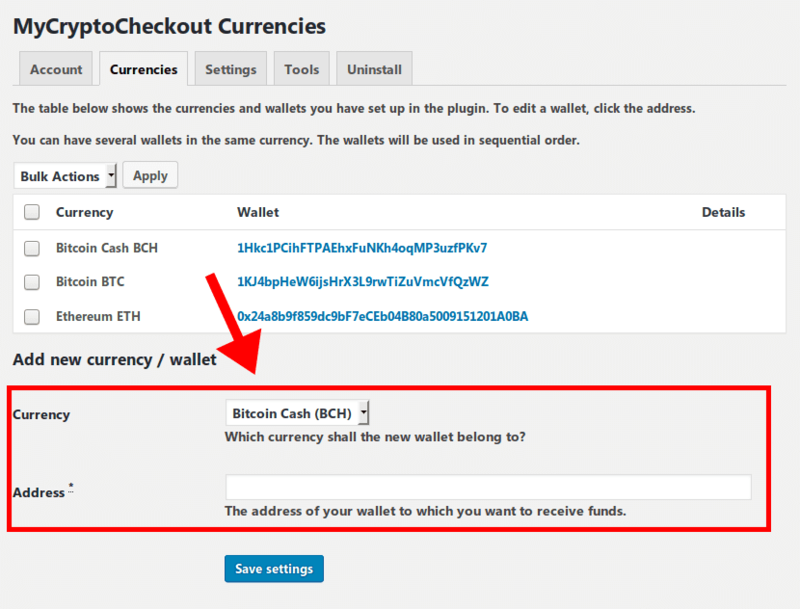 To edit a wallet, click on the address from the currencies overview tab. You can change the address of a wallet. Changing the address will not affect any orders awaiting payment, only future orders. The wallet is active as long as the enabled checkbox is ticked. Some currencies allow for changing the number of confirmations required for the payment to be regarded as complete. It is usually fine to keep this value at 1. If you raise this number, expect payments to take longer to complete depending on the blockchain. Some wallets (BCH, BTC, BTG, BZX, DASH, DCR, DGB, LTC, XVG, ZEC) now optionally support 0-conf payments. 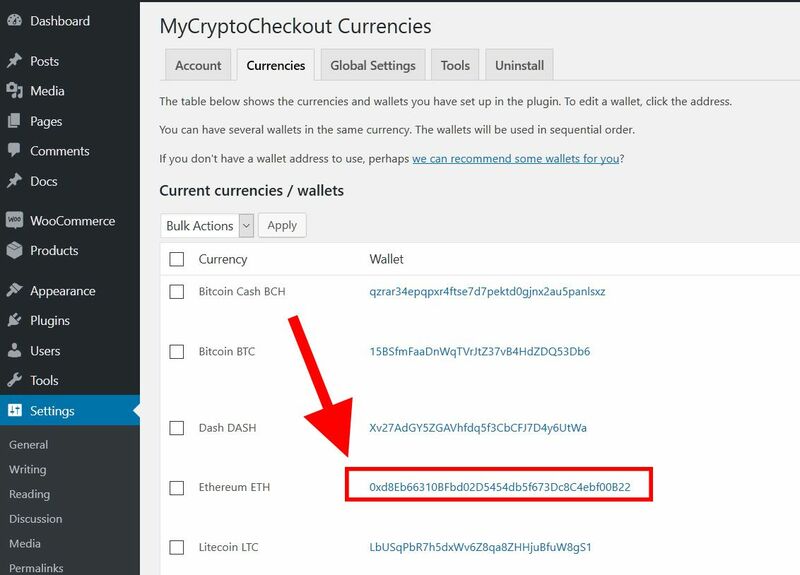 If you have installed MyCryptoCheckout on a WordPress network, you may select whether the wallet is available on the whole network or just specific sites. To enable specific sites, uncheck the network checkbox and select one or more blogs on which to enable the wallet. If you configure more than one wallet per currency, the wallets are used in a round-robin fashion, with the latest used wallet placed last in the queue.